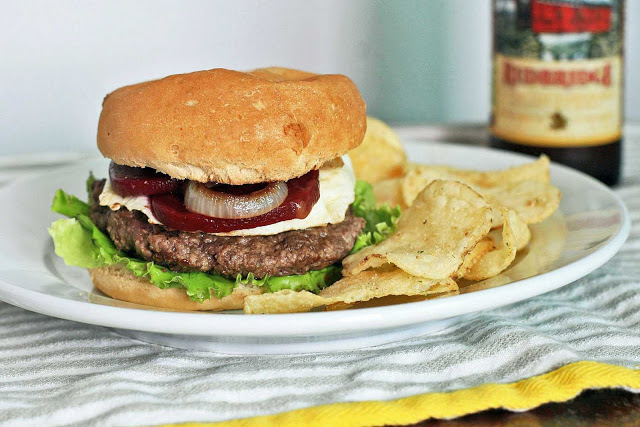 I’m not sure if I’ve been living under a rock or what, but I’ve definitely never heard of an Aussie burger prior to this week and I’d certainly never dreamed of putting sliced beets on a hamburger. But apparently that’s how they roll Down Under. 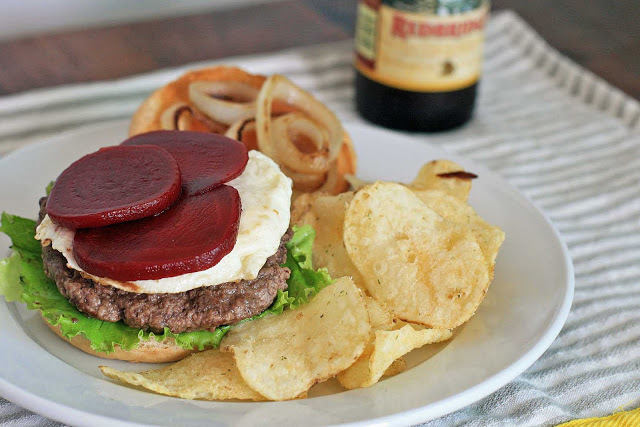 From my quick Google research, it appears though beets are just about the only thing that everybody agrees is on a Aussie burger; disputed items include: an egg cooked over easy, grilled onions, grilled pineapple rings, and bacon. I tried to keep it relatively simple and made one burger with just beet slices and grilled onions and one with beets, grilled onion and an egg. The verdict: I liked the one with the egg best… especially when the runny yolk burst and infused the whole burger like so. Mmmm…. so good. I’m sure the other variations are great as well, but be forewarned that this is one messy burger and another layer or two will make it even more so. Have those napkins ready. I’m also happy that Women’s Health Magazine just included me on their list of “What We’re Reading This Week“, which is focused on healthy links from around the web (thanks Women’s Health!). Although the timing is a bit ironic. My super health conscious friends, please avert your eyes to this here burger… and might I suggest you check out some Moroccan Spiced Carrot Soup, Avocado with Spicy Peanut Dressing, or Red-Red Stew instead? Preheat an outdoor grill for medium-high heat. When grill is ready, lightly oil the grilling surface. Mix beef with 1 teaspoon salt and 1/2 teaspoon pepper, then form into 4 hamburger patties. Lightly toast rolls on grill and cook burgers to your preferred level of doneness. Use a grill basket to cook the onions until they’re charred and tender-crisp. 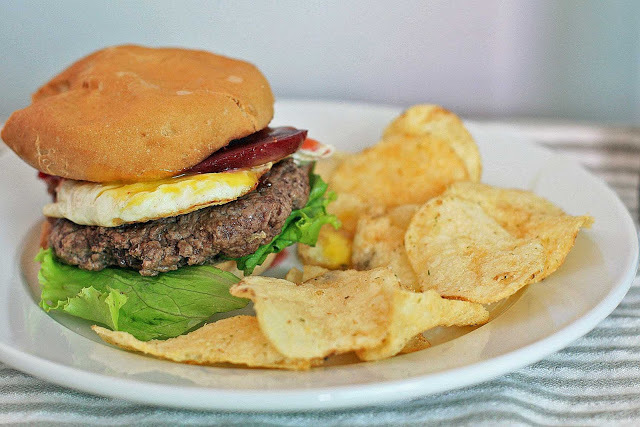 Assemble burgers with grilled onions, beets, eggs, lettuce, and tomato and your desired sauce. Note: For those of you looking for a gluten-free hamburger bun, I used these. They’re relatively expensive, but sometimes I just don’t have the time to make everything from scratch. They’re a bit on the dry side, which I actually consider to be a plus; I tend to put a lot of sauce on my burger and they soak up the sauce and the juice from the burger really well.